In my world I would like to have a cyborg-inspired veteran, but am not sure what kinds of prostheses would be possible, ideally without the use of electrics. My main concern is how the prostheses might be controlled (or whether they need to be controlled in the first place), since processing input and translating it into mechanical action is covered by the sophistication of existing technologies in my world. E.g. I have lost a leg and built a replica of my leg capable of moving in all ways a natural leg would move. I can strap it to myself, but have no way of 'steering' it. Does it respond based on the angle of my foot relative to gravity? Do I attach a string and use it like a puppet? It was possible to build a functional hand prosthesis before electricity was discovered, but the functionality was very limited. And the mechanism must be connected directly to a muscle via something like a piercing. 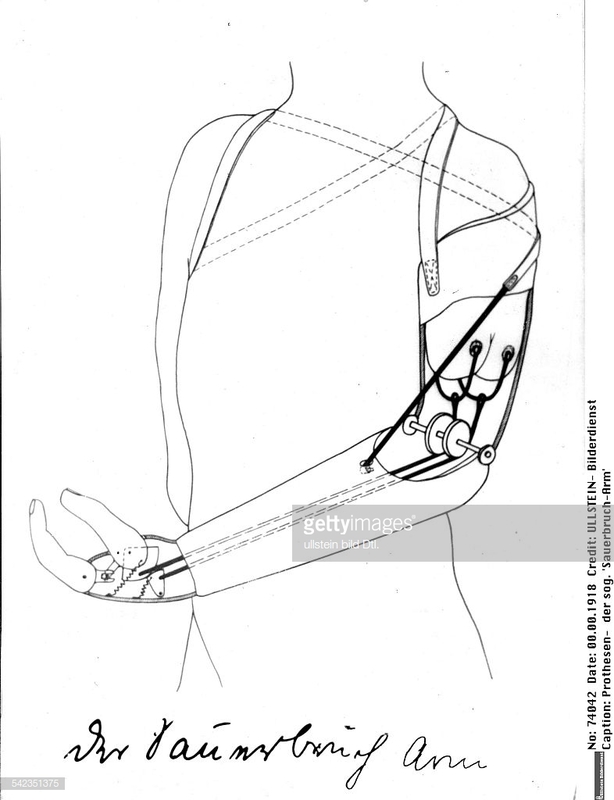 Ferdinand Sauerbruch was a German surgeon, who developed this kind of prosthesis called the "Sauerbruch arm". Here's a paper describing and showing the mechanism in figures 2 & 3 (warning for possibly disturbing pictures). Lay your arm flat on a table (or other surface) and make a fist. Now bend your fist upwards as far as possible without the arm loosing contact to the table. Feel the contracted muscle at the upper side of your arm, right below the ellbow. This is one of the possible muscles that controlled the hand prosthesis. Doctors made an incision to this muscle and put a small bar of ivory right through it (like a modern piercing, but right through the muscle). This ivory bar was connected to the hand via leather strips and pulled the hand closed when the muscle was flexed, much like a garbage claw. The disadvantage was that, although there are other muscles in that area that could control more functions, they are either too deep inside the arm or too close to each other and would interfere with each other's mechanisms. It's 21 century now and we are barely starting to have artificially controlled prosthesis. Not for the lack of effort, or lack of idea - we knew about electricity and chemistry of nerves for quite some time - but for the lack in precision of signal detection and processing. First success was in 1957, over a half century after end of Victorian Era in 1901. History of EEG started in 1875 so there is some indication we could read and interpret neural signals back in Victorian Era. Sadly, first human EEG was recorded in 1924. I can't research details why, but we clearly see that during Victorian Era people knew what they are trying to research, and did try, they just wasn't able to. For control, good thing is that on some parts you do not need to. My wife is below the knee amputee, she is still learning to walk on her unpowered prosthesis, and on a good day you can't really tell that anything is wrong with the way she walks, at all. You just need a bouncy feet, some shock absorbers, good socket etc - everything in theory possible in Victorian Era, if less sturdy and heavier. For above the knee amputations, knee is really, really tricky business. People who use prosthesis with artificial knee never walk quite the way fully abled person walks, but man, do they run! Some of them run very well and even go back to military service! Sadly, as far as I was able to understand from tech specs of such knees, precision and materials needed for modern knee are bit above Victorian capabilities. A bit - close enough that for steampunk settings I'd let that one fly. Other prosthesis would be mostly for aesthetic purposes. Mind you, that's no small deal! For endoprosthesis, it is safe to assume we had them as soon as we could. It means that bone grafts made of gold, wood, animal bone etc was known as soon as neolithic age. We (humanity) tried to and have myths about other surgeries, but there is no evidence these was successful before 20 century. No you cannot get full control back, you can get partial control, in several ways. straps to other joints, the classic split hook hand operates off a simple strap and cable. extending the arm opens the vise retracting it closes it. Grip strength is provided by opposing a spring. This basically limits you to one two joints you can control. built in dynamics. this is used most often on the leg, consider the superbly designed spring feet used to compete in the olympics by Oscar Pistorius. the weight of the body compresses the spring then leaning forward the lowered load results in hte spring pushing you forward. Early artificial legs just used gravity and springs. Elmy's answer foes into using ivory implants to move one or two mechanisms, you should look there. Other joints are either left out entirely or use some form of manually controlled locking mechanism. This can take you quite far. Consider Gotz the Iron Hand from Germany. who in hte 16th century had several artificial hands made for him, with them he could write, ride, and fight. One had a complex set of levers and springs that let the fingers be "set" in different configurations. You may also want to look up Hanger limbs where are a wide variety of artificial limbs built by James Hanger during the US civil war. Here are three papers you may find useful. A short history of hand prosthesis. And a history of artificial legs and another or prosthesis in general. I once read about a drummer boy who lost a leg in the US Civil War of 1861-65. He was dissatisfied with the artificial legs available and made a better one for himself, and started a company to sell them. The US Civil War created a vast market for artificial limbs - after the war some southern state governments spent large percentages (maybe 25 percent, for example) of their annual budgets on artificial limbs. And Americans were relatively affluent compared to Chinese after the Taiping Rebellion, for example, and also relatively inventive. Thus I suspect that many improved artificial limbs were manufactured after the US Civil War, and that comparatively few improvements were made in the rest of the Victorian era after that. Whether that is correct or not, you could ask about the best Victorian era prosthetic limbs in historical site likes History Stack Exchange, Historum, History Reddit, etc. 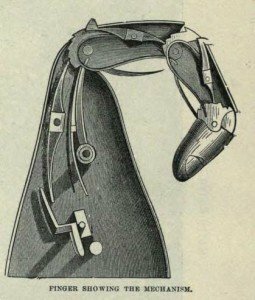 and also ask for suggestions for how the best Victorian era prosthetic limbs could have been improved using Victorian technology levels. Not the answer you're looking for? Browse other questions tagged biology engineering bio-mechanics victorian-era or ask your own question. Nanobots Ecosystem, is it possible? How much to charge for fictional substances in Victorian England setting? In a Victorian Era steampunk D&D campaign: what historic implications would it have if Scotland was underwater? What economic effects would magically-enforced isolation have on the Victorian age British Empire? Could the romans have built a mechanical sewing machine? Fart & Furious: flatulence as acceleration booster possible?